Happy TGIF you all! On my last Style Post on the blog I shared a Wedding Shower Dress to wear as the bride-to-be, while today I am sharing a Pretty Dress to wear to a Bridal Shower as a guest. Summer ain't over yet and also September weddings are very popular so a dress like this is perfect for such an occasion since it is light+airy as far as the material goes, light-colored, pretty dressy and quite feminine in the wrap silhouette with the ruffles cascading through the front creating a tulip effect and the wide sash tied into a pretty bow. You all loved my special, unique, cage overlay white sheath I shared yesterday and all agreed it would be perfect to wear for your own wedding shower. I love this dress today not just because of the awesome style and light material (it is fully lined by the way), but because it is also on huge sale for only about 20 bucks at Loft, alongside several other gorgeous dresses for the same price. I paid more than $20 for mine but last weekend I did add some more pretty dresses to my closet which I paid 20 bucks for. Loft has been killing it with their dresses this Spring+Summer 2017. Almost all the new dresses I have added to my closet this year, are from there. Also, the pretty earrings I have today are by Loft also (these ones in Millennial pink), they come in 3 colors and I own all 3 and they are also on sale. They are very light, simple, go with everything, yet fancy enough for any occasion and they certainly make a statement. They are similar to the "Danielle" earrings by Kendra Scott but for a fraction of the price and I think I prefer these ones for Loft more (I also own a couple of pairs of "Danielle's") because they are lighter. 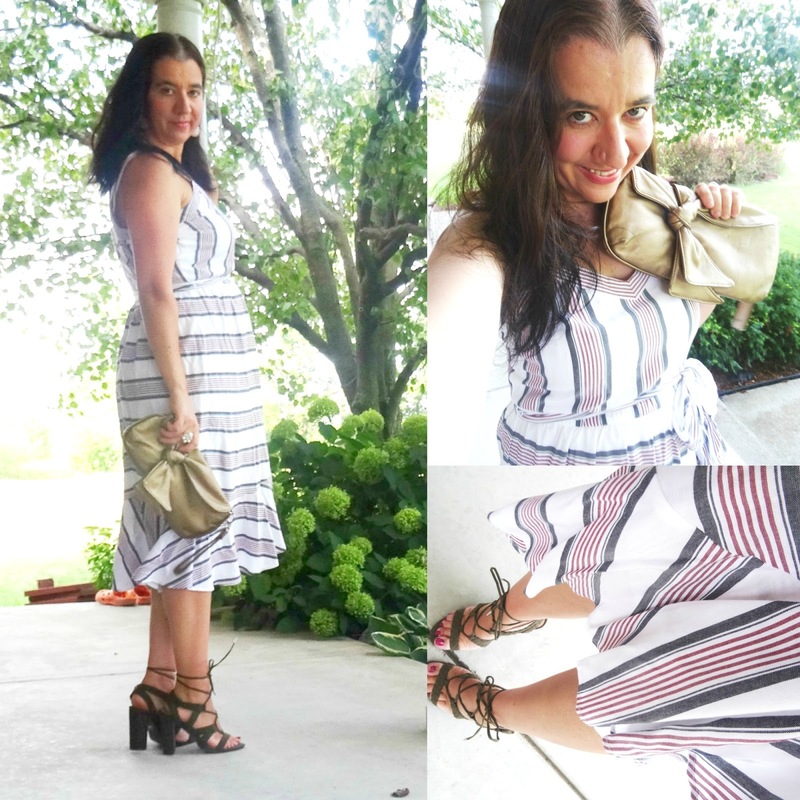 I love the unique stripes in this dress which play perfectly with the asymmetrical ruffles and pretty sweetheart neckline of the dress. 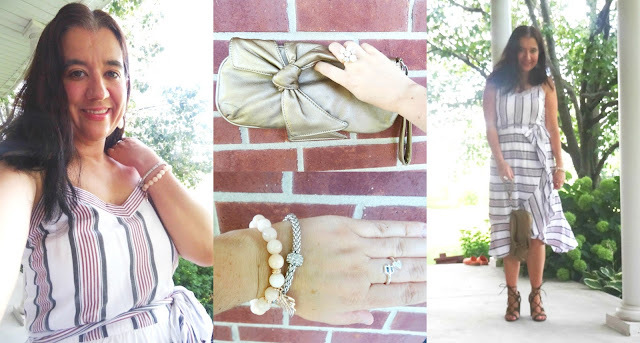 Just like yesterday accessories are important to wear with a dress like this for a special occasion like a Bridal Shower. I mixed some blush and silver pretty jewels (see photo right below) and added some earth tones and a touch of Fall with my Soft Leather Bow Wristlet Bronze Clutch and my Olive Braided Faux Suede Laceup Block Sandals (since IRL I actually did wear this dress to a Bridal Shower just last Sunday, and Fall is around the corner you all). If you follow me on Instagram, you saw snippets of this outfit and a few insta stories while we went to the shower last Sunday, with my mom and my daughter Vivian. I love the Cold-Shoulder Pinstriped Blue+White Dress Vivian wore too. It is in a thick linen-blend material. 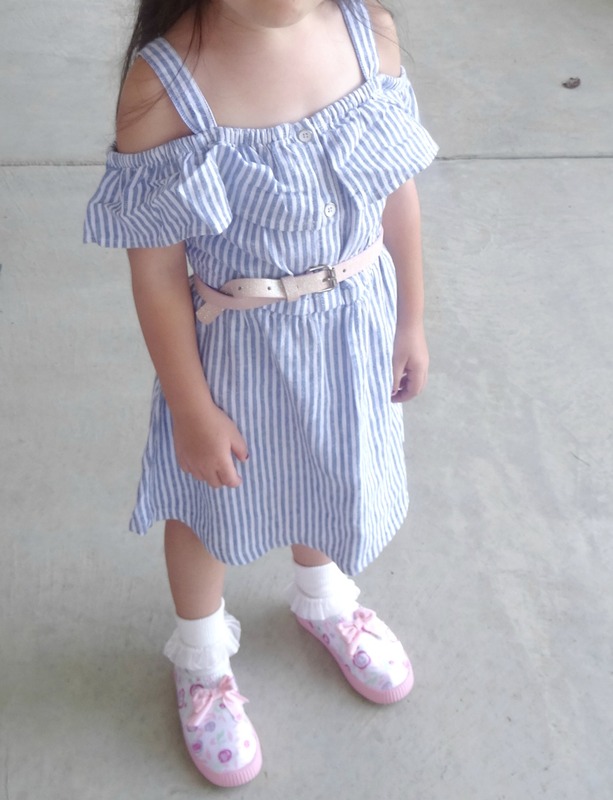 I actually own a very similar dress to hers (almost identical and it is also from Loft) but I decided to mix+match with this other Ruffled Striped Dress instead. Since the shower was in the afternoon, the air is getting a little cooler so Vivian wore some Cute Frilly Socks (they dress up a look for sure) with a new pair of Adorable Girly Slip-on Sneakers, however these sneakers are dressy because they are silk, I love that they have a pink floral pattern and that cute baby pink bow. Light Blue+White Pinstriped Cold Shoulder Dress w/ Ruffled Neckline: Old Navy (New). Baby Pink Sparkly Skinny Belt: Cat+Jack via Target (in a pack of 3) (New). White Shimmery Mesh Bow w/ Crystal Flower in the middle: Gymboree. Baby Blue Soft Leather Rosette Bag: Old (from my closet). White Cotton Frilly Socks: Wal Mart (New). My friend LYDIA of Cheap on the Chic wore this same dress a few weeks ago and she styled hers beautifully too with a Statement Necklace, Bamboo Bag and White Block Heel Sandals which would make a great Wedding Shower Outfit, too. So check it out. =) I want to wish you all a great weekend ahead and thanks for all the love on my recent posts! !